There are so many spots that are available to me at the museum whenever I am commissioned as a Mass MoCA wedding photographer. The museum presents so many incredible opportunities for North Adams wedding photographers. A bride passes through the Sol Lewitt gallery at the museum on her way to her wedding ceremony at Mass MoCA in the Berkshires. Having a wedding in an unusual wedding venue? Not doing every traditional thing you’ve ever seen at your wedding? Need a wedding photojournalist to be the one who captures it all? I’m happy to help. 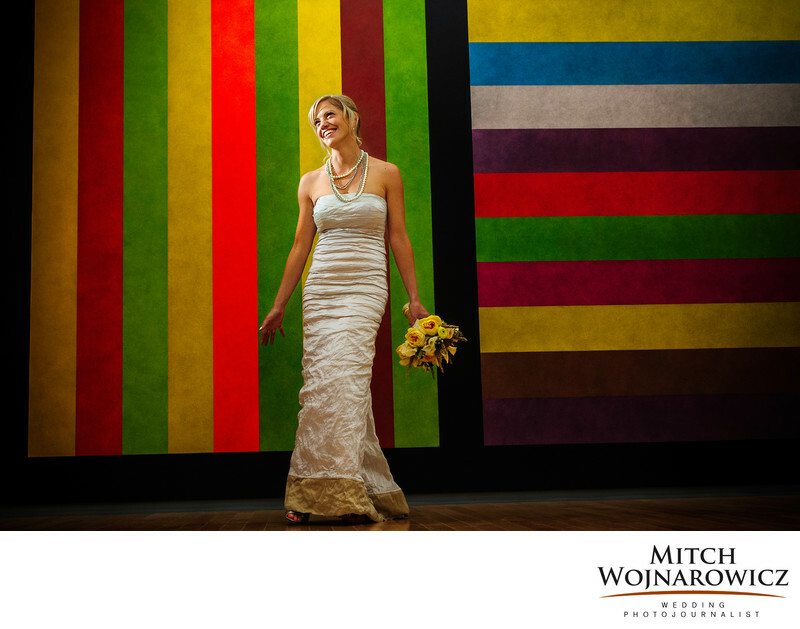 With the bright paintings of Sol Lewitt surrounding myself and the bride, I knew we had a great location for some portraits. A little extra light popped Katie from the background and her smile just did the rest, making this a memorable image for me and hopefully for her. Choosing an different wedding venue or a unique wedding venue has the side effect of being visually exciting for a different wedding photographer like me. I’m able to find so many great things to use visually for unique wedding photos. In the end, though, these great locations are the supporting characters in your wedding day. It’s not about posing for hours in front of displays for your wedding photos. It’s about emotion and reaction. It’s about capturing how your wedding day felt to you. Relationships and connections. And your wedding photos should show those things. The beauty of using a different wedding venue or an alternative wedding venue means that you might just be indoors for the entire event. That completely takes weather out of the equation for your wedding day! We know in advance where we will be. I can use that to formulate places I’d like to make some images and can take advantage of that advanced creative planning spontaneously on the wedding day. As a Berkshire wedding photographer I have worked in so many different western MA wedding venues. Whether you are having one in a super traditional location or having your wedding in a more unique location, I’ve probably already been there! Keywords: berkshires (12), mass moca (3).